I can still remember renting this video (in VHS format, no less!) back in 1982 and it really impressed me then with its visual effects! Arnold Schwarzenegger himself credited this low-budget horror film as an inspiration for his smash PREDATOR. Operating with only a $150,000 budget, Greydon Clark nevertheless manages to put together some memorable but cheesy visuals. “Without Warning” a.k.a “The Warning” involves a mysterious alien presence lurking in the woods, claiming campers and backpackers with the use of living, tentacled flying discs it hurls at potential victims. 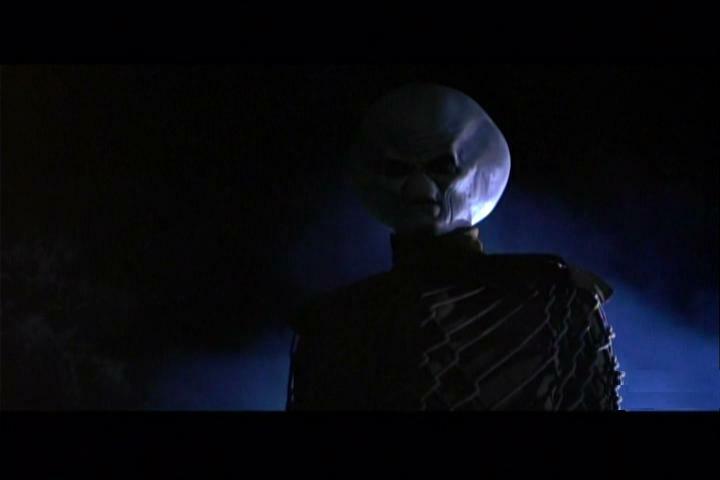 The alien spends most of the movie offscreen, throwing the deadly frisbees at people, then harvesting them and storing their bodies in a convenient old shack. In retrospect the alien does look quite silly in full light but the director doesn’t really allow the audiences to get a good look at it. Most of the time, we only get to catch glimpses of it as it stalks its victims and with the overall atmospheric lighting, it does create a certain sense of creepiness for the film. It’s interesting to note that the alien in the film is played by the same actor who played The Predator, the late Kevin Peter Hall. For those of you who’ve followed the 1985 cult TV series Misfits of Science, Kevin Peter Hall also starred in that. He played Dr. Elvin “El” Lincoln, a towering man who gives himself the ability to shrink for minutes at a time from his height of seven-foot-four to eleven inches via hormonal treatments which he activates by pressing a nerve on the back of his neck. Also look out for a very young David Caruso…who ends up as an early alien snack! On the whole, “Without Warning” feels more like a slasher film such as “Halloween” than a Sci-Fi flick. The only difference is the fact that the killer’s hurling bloodsucking frisbees instead of dicing up its victims with a machete/chainsaw! Regardless the frisbee effects were done pretty well. Could have been more enjoyable if not for the pace.